A contemporary sterling silver pendant and earrings set boasting a dash of sparkle. 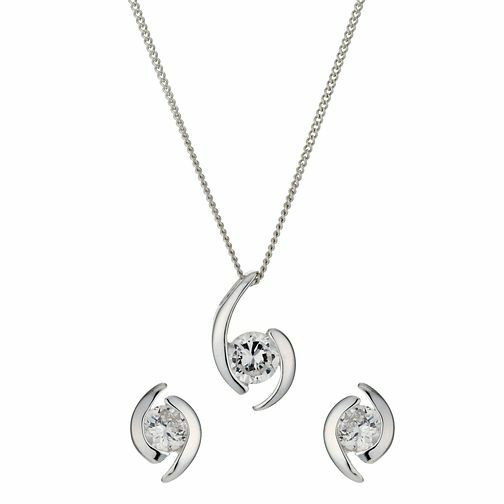 A fine 18" chain necklace is hung with a glittering cubic zirconia pendant measuring 6mm x 13mm, set in a moon-shaped rubover setting. Comes complete with a pair of matching cubic zirconia stud earrings measuring 5mm x 7mm, perfect for wearing from day to night. Sterling Silver Cubic Zirconia Earrings & Pendant Set is rated 4.5 out of 5 by 4. Rated 3 out of 5 by Anonymous from Very small for the money Expected this item to be bigger than it was. The earrrings were that small you could hardly see them . I was very disappointed but it was too late to get anything else.